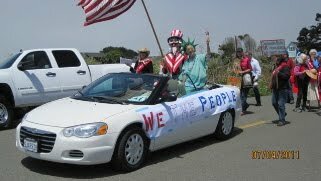 The Alliance For Democracy - News, eNewsletters, Alerts and Chapter News: Photos from Mendocino's 4th of July parade! Photos from Mendocino's 4th of July parade! There's more photos on our Facebook page! We are having a meeting to review what worked well and didn't so that we will have an improved entry in Fort Bragg's Paul Bunyan Day Labor Day parade on Monday, September 5th. Please come and share your ideas. We will have this review & planning meeting this coming Friday, July 15th, in Caspar. Email afd@thealliancefordemocracy.org for location. Facebook photos by Linda Jupiter. I am looking for a field contact in Ga.